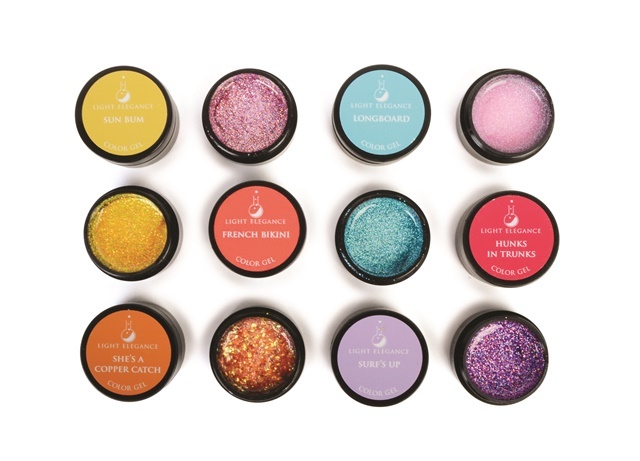 Light Elegance introduces its summer 2018 colors and glitter, available individually and in 6-packs. New colors include Sun Bum, a sunny mustard yellow, She's a Copper Catch, a creamy copper orange, Longboard, a bright turquoise crème, Surf's Up, a lilac crème, Hunks in Trunks, a bold pink, and French Bikini, a red coral with a hint of shimmer. The glitters include Woody, a tangerine with a yellow reflect, Jetty Betty, a pink glitter, Wipeout, a purple with iridescent glitter, Locals only, a pink salmon glitter, Maliblue, an aqua turquoise mixed with matte and shiny glitter, and Hotdogger, an orange coral with large flakes of gold.